On the CELTA YL course I did a story retelling task. 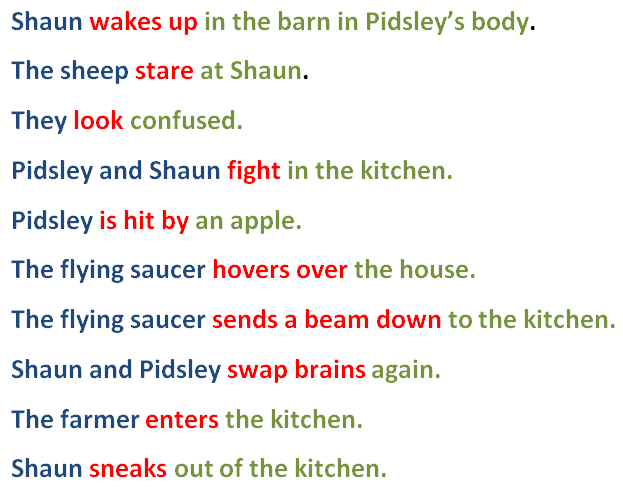 The students had watched a Shaun the Sheep video, and I’d pre-taught some of the tough vocab. After the video I wanted them to retell the story, but they needed a bit of scaffolding. What would make the activity better? The segmentation of the sentence parts here is a bit random. You could get some better learning from it by colour coding with more purpose (noun phrases, verbs, etc). Mine’s a bit loose but I hope it gives some people an idea for scaffolding.